This week I decided to go with a colour theme rather than a type of thing. 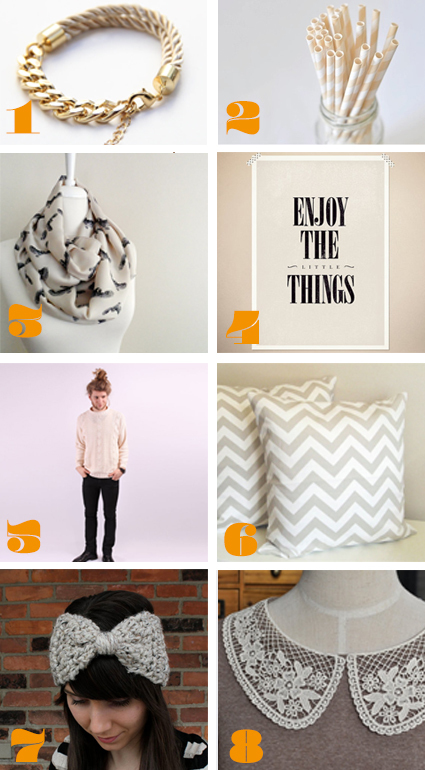 Here is a little round up of my favourite 'Taupe' things on etsy - inspired by the bean who is the creator of number 4 because she is loving taupe right now! Ok well maybe some of them are brown, beige, cream etc. but they are all fairly similar. I am loving all of these things. My etsy wish list is growing rather long! So you can find all of these lovely things here: 1,2,3,4,5,6,7,8.